Veni, Vidi, Vivi (Come, See and Live) HD | DUECITÂNIA DESIGN HOTEL is a thematic hotel, with a reinvention of Ancient Rome at its essence. A concept that strives on the fusion of the Roman cultural spirit, with a contemporary design, adapted and focused to offer the highest quality experience to guests - a unique and unforgettable experience. Where once was a paper-mill, can now be found HD|Duecitânia Design Hotel, the construction over the river, which initially had a practical and functional purpose, today allows guests an unique experience of contact with the nature right upon arrival at the hotel. When entering the building, you’ll come across the fusion of the cultural roman spirit, with a conceptual treatment and formal contemporary design – an unique and unforgettable experience. 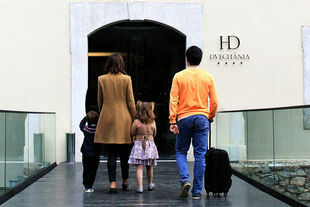 With the motto VENI, VIDI, VIVI (Come, See and Live) HD|Duecitânia Design Hotel is born. Come meet us.